The Institute for Creation Research has graced us once again with a brilliant display of their scientific prowess. This time the focus of their efforts revolves around the recently published description of a newly unearthed dinosaur species Eodromaeus murphi. Eodromaeus is a small (slightly over a meter in length) South American dinosaur from the mid-Triassic (230 MYA). This date makes it one of the earliest dinosaurs and its describers, Ricardo Martinez et al., argue that it should be classified as a basal theropod ―the carnivorous branch of the “lizard-hipped” or saurischian dinosaurs (Martinez et al., 2011). What has ICR’s, or more specifically ICR “science writer” Brian Thomas‘ knickers in a twist is that in the same paper in which they describe Eodromaeus the authors also argue for the reclassification of another dinosaur, Eoraptor (described back in the early 1990’s), which is from the same location and roughly the same time period as Eodromaeus. In a nutshell Martinez et al. argue that Eodromaeus should be classified as a basal theropod, the most basal yet discovered, and that Eoraptor which had previously held that position should be reclassified as a basal sauropod (the plant eating branch of the saurischian dinosaurs), near the base of the lineage that later gave rise to the super-giants of the dinosaur world, the long necked herbivores like the famous Apatosaurus (Brontosaurus). In his response to this rejiggering of the saurischian family tree―based on both new fossil evidence (Eodromaeus) and a reexamination of earlier finds (Eoraptor)―Mr. Thomas exposes, yet again, a number of flaws in ICR’s basic understanding of the philosophy of science as well as their understanding of evolutionary theory. Apparently in Mr. Thomas’ mind the fact that scientific conclusions change in the light of new evidence actually disqualifies them from being science at all. The implication being that in order to be “truly scientific” our ideas about the details of dinosaur evolution should be, like dinosaur fossils themselves, fixed in stone and unchanging, regardless of any new evidence that might later be uncovered. So you begin with your conclusion, in this case a particular interpretation of the book of Genesis, and stick to it regardless of any “difficulties” you might encounter with the actual evidence. Let the evidence be damned, literally. This is the very essence of “creation science”. Another more prosaic problem with Mr. Thomas’ statement above is with the idea that Eodromaeus supposedly removes a “previously designated dinosaur common ancestor”, in this case ostensibly Eoraptor. The problem is that while Eodromaeus, or Eoraptor before it, might be described in some popular science reports as being the “common ancestor” to later theropod dinosaurs, such statements are not found in the actual scientific literature describing these organisms. So whatever some science reporter/blogger might have said or implied, the authors of the papers describing Eoraptor and Eodromaeus in the scientific literature say only that they are “close to the predicted structure and size of the common dinosaurian ancestor” and “approximates the hypothetical ancestor” of later theropods, not that they actually were the ancestors. And here is a perfect example of what we’re talking about. The quote Mr. Thomas gives above is from a newspaper article in the USA Today (Weise, 2011) and it misleadingly implies that scientists are making definite claims about Eoraptor being ancestral to later dinosaurs rather than merely looking like it might be the ancestor, or perhaps being closely related to the actual ancestor. 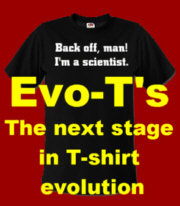 If Mr. Thomas were simply being critical of the fact that some science reporters occasionally mislead their readers with apparent claims of definite ancestral status when describing basal fossils like Eodromaeus or Eoraptor, then I would wholeheartedly agree with him, but somehow I doubt that Mr. Thomas’ true target is really misleading science reporting. Thomas: Evolutionists have variously proposed it as the ancestor of two of the three major groups of dinosaurs: ornithischians, which included the Triceratops and Hadrosaurs; and saurischians, which included sauropods like Apatosaurus, and theropods like Tyrannosaurus. This statement is somewhat odd, because I don’t know why Mr. Thomas is bringing up ornithischians (the so called “bird-hipped” dinosaurs) in this context. As far as I can find no one, in the scientific literature, has ever suggested that Eoraptor was a basal ornithischian or even basal within the Dinosauria, in the sense of being in the group ancestral to all dinosaurs, both ornithischian and saurischian. Rather it has, until recently, been primarily considered a basal theropod or perhaps basal within Saurischia, i.e. in the group ancestral to all later saurischian dinosaurs, both theropod and sauropod. Well, at least Mr. Thomas, unlike some other creationists, seems to generally understand the difference between ornithischian and saurischian dinosaurs. Which is good since the ICR web site lists dinosaurs amongst his specialties. Thomas: But identifying a single creature as the ancestor of the wide variety of dinosaurs—which include the tank-like Stegosaurus and massive Ultrasaurus, as well as the tiny two-legged Compsognathus—has been notoriously difficult.3 What features could clearly identify such an ancestor? And if it turns out to be impossible to identify, then could such an imagined creature even have existed? Here we see a classic example of a creationist failing to grasp how evolution works over geologic time scales. Mr. Thomas essentially asks his readers to try and imagine an ancestral dinosaur, implying that such an animal should somehow combine all sorts of derived characteristics. 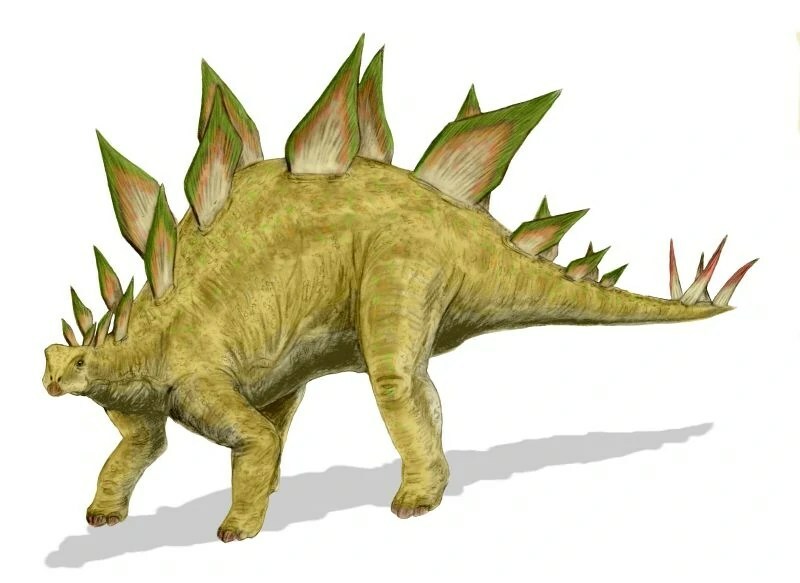 As if the common ancestor of Stegosaurus (an ornithischian) with its plates and spikes, Ultrasaurus (a.k.a. Supersaurus) a massive long necked sauropod, and Compsognathus, a small carnivorous theropod, were all squished together into some improbable chimera. The problem is, of course, that these three types of dinosaurs are far removed from their common ancestor which would not have had all the bells and whistles added by millions of years of evolution found in the different branches of their descendants. Thomas could have used a more obviously derived theropod like Tyrannosaurus to better effect since at least on a superficial level Compsognathus doesn’t seem nearly as derived as Stegosaurus or Supersaurus. I say this because the actual ancestor of all dinosaurs ornithischian and saurischian (both theropod and sauropod) is thought to have been ―based partly on finds like Eoraptor and Eodromaeus― a fairly small (a little over a meter in length) bipedal archosaur ―the group containing not only dinosaurs (and their avian descendants) but also crocodilians and extinct types like pterosaurs. 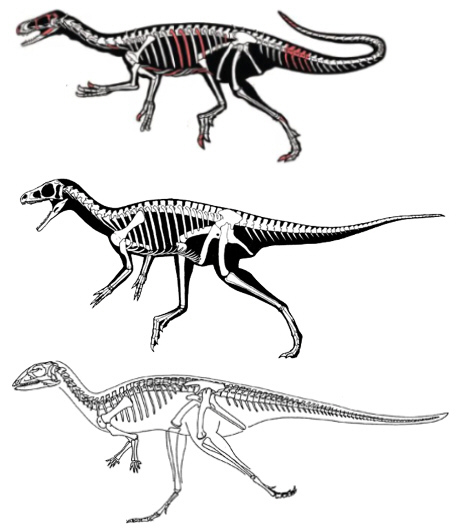 Pictured here are Eodromaeus (top) a basal theropod, Eoraptor (middle) a basal sauropod (according to Martinez et al.) and Lesothosaurus (bottom) a basal ornithischian. They are all about a meter or so in length and date from the Triassic period. As you can see, imagining a common ancestor between these animals is a bit less difficult than working with their later more derived relatives. In fact I wouldn’t be surprised if some creationist confronted with these three dinosaurs might argue that they were all part of the same created “kind”. The differences between them certainly aren’t much greater that other groups where creationists have done just this this. Once again I must ask: does Mr. Thomas (ICR dinosaur specialist) not know this information or does he know it and chooses not to inform his readers about it? If it is the former then he is too ignorant to making grand pronouncements about the subject. If it is the later then his honesty is much in question. Thomas: In other words, some scientists believed that the Eoraptor could have been the evolutionary ancestor of all saurischians, or just the theropod saurischians, or just the sauropod saurischians. These authors favor the latter, since Eodromaeus looks more like a theropod than Eoraptor does. In their view, now that Eodromaeus has been designated the new ancestor of theropods, Eoraptor is out. Of course both Dr. Gish and Mr. Thomas miss the point entirely. That there is sometimes confusion or debate about the classification of animals like Eoraptor or Hyracotherium which are near the base of larger clades of organisms is exactly what is predicted by evolutionary theory. Sure horses and rhinos are quite different, now, but the farther you go back in their lineages the more they converge until it is difficult if not impossible to tell fossils that belong to one group from the other, or which might perhaps be ancestral to both. So Mr. Thomas presents his readers with the scenario of a bunch of scientists quibbling over whether Eoraptor is a theropod or a sauropod and suggests that since there is confusion it must be neither. The reality is that A) evolutionary theory predicts that distinguishing between organisms at the base of two closely related clades will be difficult (perhaps even impossible); and B) one of the lead scientists in the description of Eodromaeus, who is arguing for the reclassification of Eoraptor as a basal sauropod (instead of a basal theropod) is Paul Sereno, who as it happens was the lead author in the original description of Eoraptor as a basal theropod (Sereno et al., 1993). Again Mr. Thomas wants to foist his religious sensibilities onto science. If scientists don’t have absolute certainty (like fundamentalists), and they never do, then it’s all just subjective guesswork. The basic idea behind cladistics is that members of a group share a common evolutionary history, and are “closely related,” more so to members of the same group than to other organisms. These groups are recognized by sharing unique features which were not present in distant ancestors. These shared derived characteristics are called synapomorphies. It isn’t perfect but it is a far cry from simple guesswork as Mr. Thomas would have us believe. If Mr. Thomas wants to claim that this is all merely guesswork he is going to have to more than shout “is so!” over and over and attempt to refute it in detail, based on observations of the fossils. It’s called doing science rather than propaganda. Thomas: And Eodromaeus was found fully formed, with no hint of any body part transitioning into another. Of course it was “fully formed” Mr. Thomas. As I’m sure you’ve been told before, all species under evolutionary theory are fully formed whatever they are; even if they are transitional or intermediate forms. If Eodromaeus murphi was indeed the ancestor to all later theropods (something we can never know with certainty) it was still a fully formed Eodromaeus murphi. This is just creationist weaseling that literally has no substance. If you try and get them to define exactly what they mean by “fully formed body parts”, it either devolves into nonsense about animals with half an eye (like an eye-ball cut in half) or less often they describe what we actually do find (but what they don’t want to admit); that there are organisms with intermediate characters. Ask and ye shall receive. Mr. Thomas is nice enough to provide us with an example of why his talk of things being “fully formed” is nonsense. Here he argues that because Eodromaeus is in a “completed two-legged form” it cannot be transitional (I think he means ancestral). Now he could mean by this that it has two hind limbs, a character shared by all tetrapods (land animals) since they first crawled out of the water (actually long before that). Or perhaps he could mean that it is bipedal, walking on its hind limbs, a character shared by all basal dinosaurs and therefore exactly what one would expect in the first dinosaur (quadrupedalism, walking on all fours, in later dinosaurs was re-evolved in some dinosaur lineages). I wouldn’t want to insult him by asking if he means that they don’t literally have half formed legs (like embryonic limb buds), but who knows. Regardless, the presence of two fully formed hind limbs (used for bipedalism or not) has no bearing on whether or not Eodromaeus evolved from and earlier dinosaur or was ancestral to later dinosaurs. Thomas: Since Eodromaeus has no transitional features and is a well-coordinated collection of integrated parts, each of which may or may not be shared with other dinosaur species, this fossil offers no answers to the questions of evolutionary dinosaur origins. And they continue on discussing what this evidence suggests about the early evolution of dinosaurs and the environment they lived in. Thomas: Instead, it looks as though it was fully formed on purpose from the start. 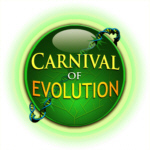 This entry was posted in Antievolution, Comparative anatomy, Creationism, Defending evolution, Evolution, Paleontology, Systematics and tagged Antievolution, basal dinosaurs, Brian Thomas, cladistics, Creationism, dinosaurs, Eodromaeus, Eoraptor, ICR, ornithischians, philosophy of science, saurischians, sauropods, The Institute for Creation Research, theropods. Bookmark the permalink. Hmm —a human five year old looks pretty “fully formed” to me —– how could it possibly change over time into a decrepid wrinkled ninety year old? The ICR brain trust is based about 15 miles from me. I became aware of them because I get junk mail addressed to a previous resident of my house. I’m frequently tempted to make the short drive to Chino Valley (aka Methistan) to mock them. I think you’ll find that the facility in Chino Valley, Arizona, belongs to the Creation Research Society rather than the Institute for Creation Research which is now headquartered in Dallas, TX (formerly in Santee, CA). However these organizations are essentially identical in their beliefs (and even have some overlap in membership) so your comment remains otherwise appropriate.